Plains is a small community with a rich history. Years before the first white settlers established homes here, Indians made this fertile land with its many creeks and streams their home. Even today reminders of the past can be found on farmland as fragments of flint and arrowheads appear after the deep plowing of farm tractors or a washing rain uncovers a treasure from the past. Our community is indebted to Milton Leander Hudson who donated the land for the town of Plains and the train depot. The train ensured prosperous times for merchants and landowners of this agricultural community for many years. As our community changed, the depot sat silently, a reminder of the past. It was an important part of our heritage, but an exciting event was in store, as it became the backstage for an event which no one expected. 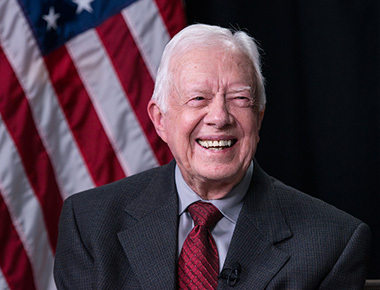 As those famous words rang through the nation, ” My name is Jimmy Carter and I am running for President of the United Sates of America,” the depot and Plains were thrown into an unexpected arena of world publicity. Some of the residents of Plains began to look a the community and decided that the presidential announcement would be the beginning of many changes that would occur in the future. After much discussion and planning, the decision was made to form the Plains Historical Preservation Trust. The mission of the Trust would be to own, lease, operate, preserve, renovate, use and or maintain real and personal property of historic significance in and about the City of Plains, Georgia, and to cooperate with other persons, firms, corporations, and government agencies to the same end. Plains Historical Preservation Trust was officially incorporated on October 11, 1977. Through the years, the Trust has worked diligently to secure land and buildings of historic significance. The Trust assisted in the renovation of Plains High School Museum and donated the Depot to the National Park Service to be used as a museum. Presidents of the Trust include: Buford Reese, P.J. Wise, Maxine Reese, Steve Smith, Ellen Harris, Annette Wise, Jan Williams, Kim Fuller, Bernstein Hollis, and Michael Mallard. The Trust believes the history of our community is significant due to our heritage and ancestors. Our history is also unique since the 39th President and First Lady of the United States of America were born, raised, and continue to live in Plains.